At the beginning of the year, we had the pleasure of reviewing the Hue Animation software for Moshi Monsters; it was a massive hit with both of my kids, and we recently were able to review the updated Hue Animation package. I let my daughter take it for a test drive with her Lego, as well as having a little go myself too. What is stop motion with Hue Animation? This is the standard software, no tie ins, that includes all you need to get started on stop motion animation. CD that includes all the software, backgrounds and sound effects for the package. You can, of course, get more from your computer elsewhere. In addition to what comes in the box, the company has a great YouTube channel which offers examples of what you can do with the software, including some of the examples contained within the Book of Animation. This is a great video – watch out for a bit of cheekiness at the end though…. The Book of Animation is actually available to buy separately from Amazon for £7.45, so an added bonus to it get free with the software. The website for the company also has some great resources too, including tutorials, and downloads from the book, as well as additional backgrounds for you to use. What did we think about playing around with stop motion with Hue Animation? As with all our reviews, I like to get the kids hands on immediately, and this is the video that my daughter put together, ALL ON HER OWN, straight out of the box. She has, of course, already done things with Hue Animation before because of the previous version of the kit that we had, but the new book provided with the software, and the ease with which the controls can be found and operated on the Mac, really helped us to get off to a flying start. It was easy to set up the camera out of the box, and my daughter was keen to try an above shot animation with her new Lego Science Lab that she had just built! This took my daughter just over an hour to put together, including the audio. It isn’t perfect, but its a great start. We did have a little difficulty with the arm of the camera, which kept slipping a little during shots, but once we found the right angles, all was well. The onion skin feature of the software means that if things do move accidentally, it is easy to put them back to where they need to be. Onion skin shows an outline on the next photo of where everything was when the previous one was taken; a very helpful feature when you are trying to create movement in your animations. However, it clearly isn’t. This could be a stickler for a few of the older children that use the software – instructions are for wimps after all! ;-) With a little gentle encouragement, we were happy to take a look in the end though. The picture quality, once you get the focus right (! ), is great with this new software, as the camera supplied is now HD. Sadly, this does seem to create large files for the program, which means that whenever you try and share to YouTube directly within the package, it crashes. There is a simple fix for this on a Mac though, sharing to QuickTime and then uploading to YouTube from there. For other problems, they do have a Mac Troubleshooting section on the Hue Animation site. We even managed to get it to work for mum too! As you can see, we picked up a free elephant trumpeting sound in our movie above. Annoyingly though, there was no way that I can find of editing the audio once it has been added. For example, I wanted to cut short the trumpeting on this audio, and it didn’t seem to quite allow that. Therefore, we had a very talkative memory elephant….but then, my daughter fixed it. See – child’s play! ;-) There may also be a little bug in the audio though, and our reviewers also commented on the quality here too. When my Daughter was recording audio, she had to click the record button to stop and start the dialogue she wanted over the top of the movie. Sometimes, this click is picked up in the soundtrack. This is definitely worth looking at in more detail for future releases. You can, of course, shoot the photos on another camera and import them, but my kids love the camera it comes with and would like to use that if they can for their films. 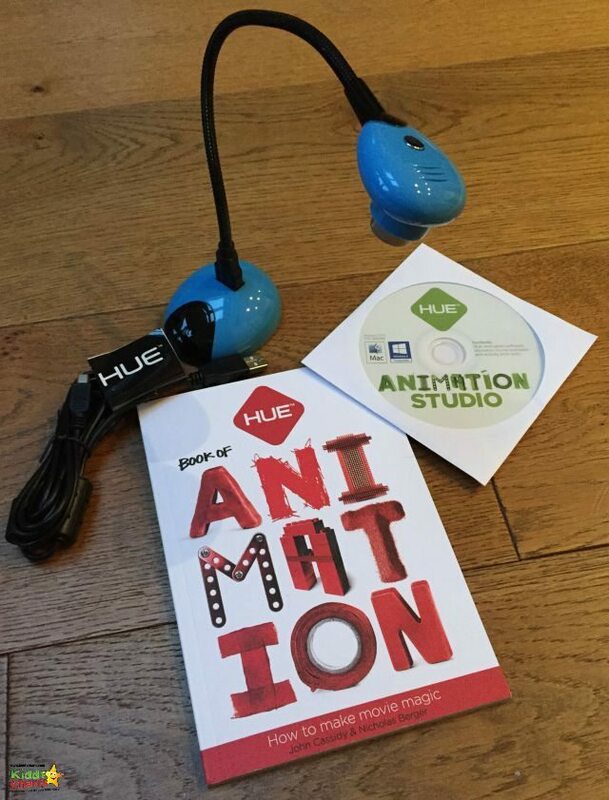 What did our reviewers think of the Hue Animation stop motion software? We asked two other mums with children to take a look at the software and see what they thought of it, as a way of exploring stop motion animation, but also in terms of value for money and ease of use for their kids. The software was a hit with them too! Another success for the company, though the bugs we mention do mean that it wasn’t quite up to the levels we experienced last time we took a look at it. This could be because it isn’t as “fresh”with the kids as it was. Significantly, they still don’t seem to have an undo option within the software which was a significant downfall of the previous version. It would have been good to see this improved at this outing. It is wonderful to see that the camera is now high definition adding so much more clarity to animations. Once we got over the idea that the book was boring, this proved to be a signifcant improvement too, and is well worth the price on Amazon for any kids that are just interested in the topic. In researching this post, I found some rather stunning animations put together using the Hue Animation software, and the best of the lot was this wonderful video from Elizabeth’s Kitchen Diary, who can not only cook better than me, but can clearly animate significantly better too. Stunning. You can really see with this just how powerful the stop motion animation software can be when you use it to its full potential. Have fun – we are going to! This is a sponsored review, but all opinions are my, and the reviewers within the post’s own opinions. We test drove the software hard, and have full editorial control. The post does contain some affiliate links too. Hue animation! It’s a magnificent software which is perfect for the kids. Though I don’t think so that it’s only for kids but also for all who love to make animation. I already tried to use this and got fantastic experience on it. So believe it or not just try it.